Deuter presents the first child carrier with the renowned SL carrying system for perfect women-specific fit – a long-awaited product for outdoor-loving mothers. The carrying system is specially adapted to the female anatomy. The shoulder straps have a distinct S-shape, soft edges, and narrower ends. Conical hip fins nestle impeccably against the hips. The extremely light, adjustable and well-ventilated Lite Air System contact back is connected directly to the frame for perfect load transfer and control. 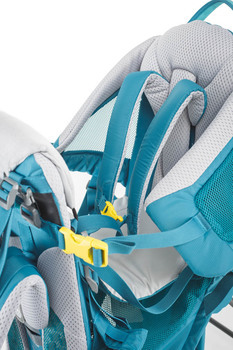 Additional benefits are side access to the seat, easier child placement, easy height adjustment with seated child and the new safety harness with easy-to-use color-coded buckles on the sides. 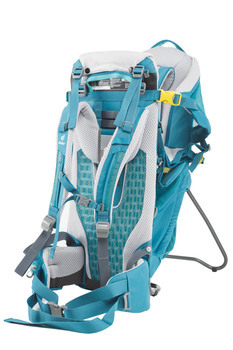 The first Deuter child carrier to hit the market with a carry system designed specifically for the female anatomy. With the comfort, functionality and high quality we have come to expect from Deuter. 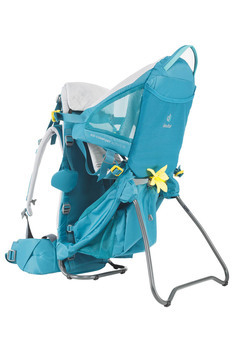 The Kid Comfort Active SL certainly deserves this award.